A couple of weeks back marked an exciting step in an ambitious project I'm working on with BallyCara, an aged care provider in Brisbane. 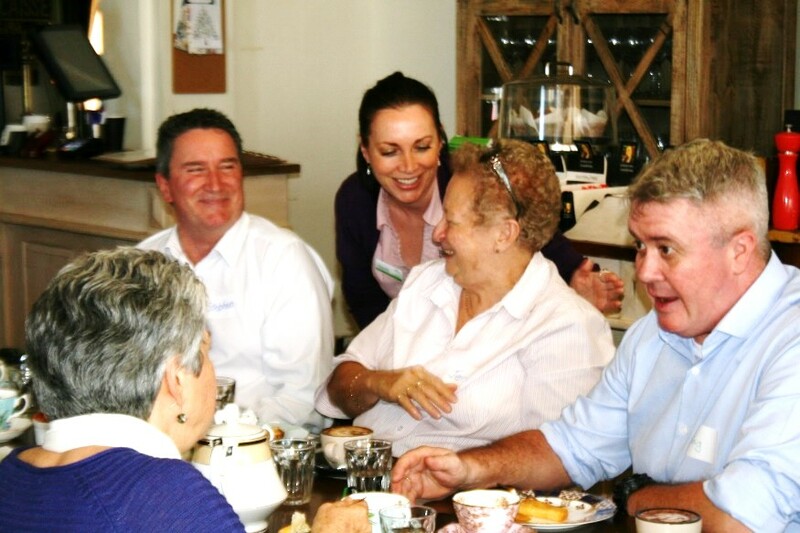 We feel that Australia's ageing population is a huge opportunity for us to do something different about the way we engage with older people, and ensure that they continue to feel valued, contribute to the community, and have a long fulfilling life. Based on many conversations I've recently had, many people across all age groups agree that now is the right time for this. Inspire Share Connect is our prototype for a new community hub that will be built to re-imagine retirement and ageing. We want to engage the community in what these hubs may look and feel like. A unique blend of hospitality, community, and a range of experiences to nurture physical, mental and social wellbeing. Our pop-up days are just a taste of things to come. We were fortunate to work with the team at Matthew Thomas Cafe, Sandgate, Brisbane, who had an awesome venue in an old Masonic Hall overlooking the water. I arrived early to soak up the view, and the hospitality of the venue; tables lined with old tea cup sets, and an assortment of antiques and historical items from yesteryear. The perfect spot to make our guests feel at home. There was a beautiful moment outside where the magpies where warbling their song to me. When the BallyCara team arrived, we were all feeling a little nervous, but in a good way. We knew that we were embarking on something new and exciting together. Once we were set up, we started to mingle with the arriving guests, and the other unsuspecting patrons that were visiting the cafe. They were curious about what we were up to, and incredibly supportive of it, many sharing their own stories of why they wish there was more of this kind of thing around. We had a great range of activities and talks to engage our audience. Tommy took guests through some stretching and breathing exercises; Paul inspired them with his vision for healthy ageing at home, with a very cheerful and witty guest speaker, Jean, who in herself is an amazing vision of someone who has aged so well at over 90 years young. We broke for afternoon tea with an invitation to connect with someone who was new, and share what you are most passionate about in life. I've done this kind of thing with other corporates and adults who usually show some reluctance to open up, but I was surprised how quickly our guests engaged with each other here. They embraced each new meeting with gusto and compassion, which was so lovely to observe. 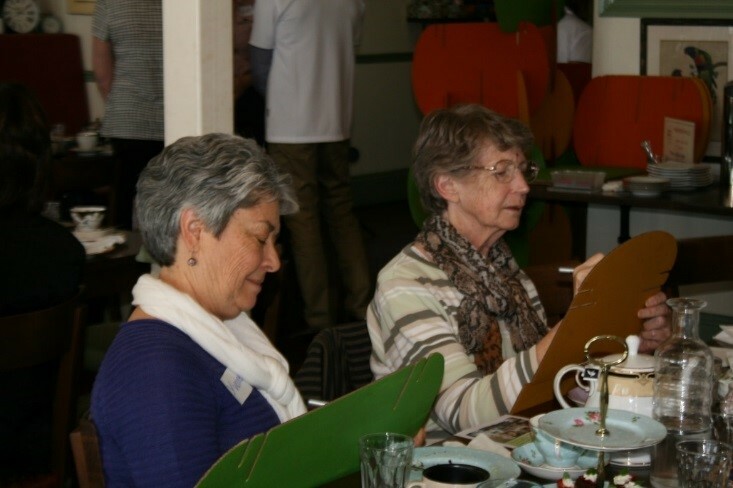 The room was full of energy, laughter, new friendships, all helped along with cake and tea. It was also so good to see the Ballycara team right in there with the guests, enjoying themselves. It's moments where you step back in wonder of the opportunity to host a group of people like this. They are precious, golden points in time that I relish. One of our ongoing activities through the day was the Wisdom Wall, which was an invitation to share a pearl of wisdom to their younger selves. Here are some of the great messages shared. I'm sure you will agree that they are all great things to keep in mind for all of us, no matter our age. Stay active, eat well, and make time for family and friends. The more we give, the more we get. The more we laugh, the less we fret. A coincidence is a window into the divine. Our last session of the day was my favourite. 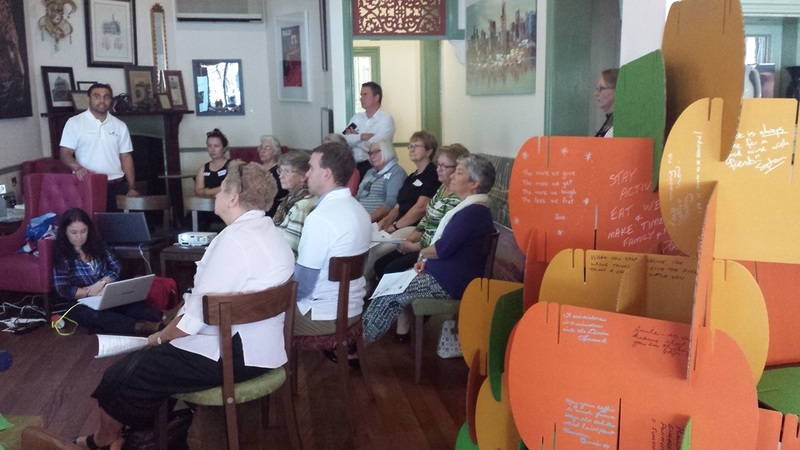 We had invited Danielle Neale, Innovation whiz and founder of Bespoke Software from the Sunshine Coast to present on what was possible when embracing technology for our seniors. As a surprise to us, we had the absolute pleasure of also having her 13 year old daughter, Lili, present with her Mum also. What ensues was an incredibly engaging and delightful play between daughter, mother and our audience. Starting with Lili's Chilli game where she outsmarted all in making guests pick the chilli over chocolates to demonstrate how algorithms sit behind all technology. After some play with wearable fitness technology (thanks to Harvey Norman for bringing the toys), Lili and Danielle gave us their top 10 apps for everyone's phones and tablets. What struck everyone in the room was the impact that having Lili there made for all our our guests. There is something about the energy that young people bring which lifts us all up. For older people, this might come from their grandchildren. What was definitely evident was that everyone was enriched by engaging with her, and many told us after that having her there was the most inspiring part of the event. We are driven to inspire a different way of thinking about what it means to age in our society. We know this means offering a different way of engaging our older citizens; re-positioning retirement as a time that we all look forward to, as full of opportunities to connect across generations. To share what we have learned with anyone who might listen. To age gracefully and healthily, and be valued for what we have done and can still offer. To continue to matter and be respected as leaders and elders. This was just the first step to bring our vision to life in our communities. Stay in the loop here with upcoming events and developments, and feel free to reach out to connect if you would like to be involved in the next chapter of this exciting story!